How can community acupuncture help? Community acupuncture is a very powerful tool and healing modality in treating a variety of individual and community conditions in rural and under-served areas. However, we do not consider ourselves an "Alternative" or "Acupuncture" clinic. We serve as Primary Care Providers in the remote areas in which we operate. Providing a very effective, cost-efficient new model for this type of clinic. We work very hard at documentation, research and other measures of efficacy to show how we are able to serve in this capacity. Most importantly our practitioners are the primary source of medical advice, assessment and diagnostics for our communities. We treat with acupuncture, naturopathic and allopathic modalities as we deem effective and we refer to hospitals and other specialists as necessary (when they are available). The access we provide to basic care has an immeasurable impact on influencing both overall individual and a community health. Acupuncture is very easy to teach to other healthcare workers giving them additional low-cost methods of treating chronic pain and other pathologies. Clients are treated in a group, sitting up in chairs, fully clothed. Acupuncture does not rely on the availability of expensive medications and can be extremely effective in treating pain, neurological conditions, digestive disorders and anxiety. • Acupuncture addresses physical and mental health conditions simultaneously. • Effects are immediate, but can also be long lasting, well beyond the time the treatment is being given. • While the treatment alleviates symptoms, it is also a general balancing treatment, which treats not only symptoms, but also the root cause of the symptoms. It addresses the whole person and has a comprehensive effect. • There are almost no side effects or contraindications. It is non-addictive. • Equally effective when there are language or cultural barriers. • Healing in a community environment is especially beneficial when a disaster, trauma, or conflict has affected the whole community. • Acupuncture in a group setting allows the community as well as the individuals to experience healing. 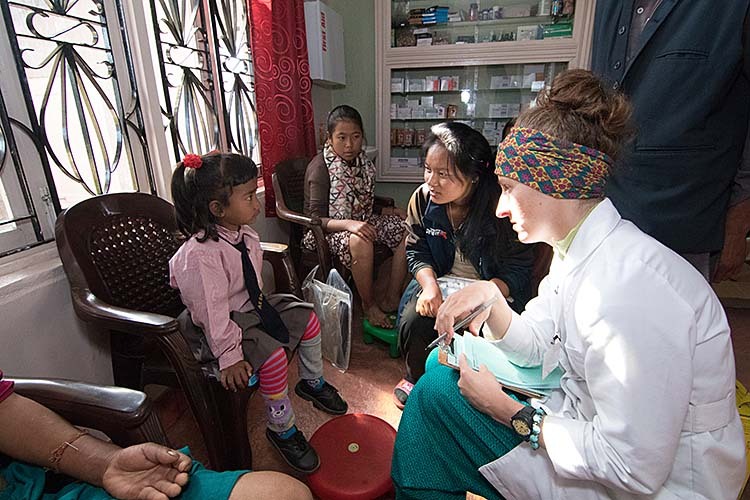 In addition to providing aid to this besieged community abroad our practitioners will gain valuable experience that will aid in their personal development and compassionate treatment of their patients back home. Please consider supporting our project by making a tax deductible donation. Every dollar we collect goes directly to the purchase of medical supplies and operating expenses of our field clinic. Every dollar allows us to provide one patient treatment. $20 pays for an interpreter for 10 days! $50 pays for one practitioner's clinic supplies for one week! $100 pays all of our clinic expenses for one day! Think for a moment about how much impact we can have when we can treat 120 people for as little as $100. Home to eight of the highest mountains in the world including Mt. Everest, Nepal is a landlocked country in South Asia known for its natural beauty and its many temples and places of worship. Though a small territory, the landscape of Nepal is unusually diverse, ranging from humid jungles in the south to the lofty Himalayas in the north. 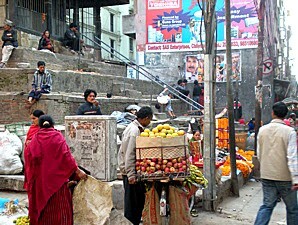 Nepal’s largest and capital city is Kathmandu with over one million people crowding its narrow streets. After a long and rich history, Nepal became a constitutional monarchy in 1990. This arrangement was marked by increasing instability and in 1996, large swaths of the country were embroiled in a guerilla conflict with Maoist insurgents seeking to overthrow both the monarchy and Nepalese mainstream political parties to establish a Maoist state. In 2006, after a decade of chaos in which more than 11,000 people died and nearly 200,000 were displaced the King agreed to relinquish sovereign power back to the people and reinstated the dissolved House of Representatives — which promptly declared Nepal a secular state. In 2008 the king was deposed and a democratic republic was established. Nepal remains one of the world’s poorest countries, with a per capita income of just US $244/year. Rural people — who make up more than 85 percent of Nepal’s population — continue to struggle with extreme poverty, the disenfranchisement of vulnerable minority groups, political corruption, and a lack of government and social services. Many young people have migrated from their remote villages to urban areas and even to India or the Gulf States to avoid recruitment into the current conflict and to seek better economic opportunities.